The computer in each office was bought either in an earlier year than or in the same year as the printer in that office. The computer in office 2 and the printer in office 1 were bought in the same year. The computer in office 3 and the printer in office 4 were bought in the same year. The computer in office 2 and the computer in office 3 were bought in different years. The computer in office 1 and the printer in office 3 were bought in 1988. If the computer in office 3 was bought in an earlier year than the printer in office 3 was, then which one of the following statements could be true? The computer in office 2 was bought in 1987. The computer in office 2 was bought in 1988. The computer in office 4 was bought in 1988. The printer in office 4 was bought in 1988. The printer in office 4 was bought in 1989. The printer in office 1 was bought in 1987. The computer in office 3 was bought in 1989. If as few of the eight machines as possible were bought in 1987, then what is the exact number of machines that were bought in 1987? If the computer in office 4 was bought in 1988, then which one of the following statements must be true? The printer in office 1 was bought in 1988. The printer in office 1 was bought in 1989. The computer in office 3 was bought in 1987. If the computer in office 3 was bought in 1988, then which one of the following statements could be true? The printer in office 2 was bought in 1988. The computer in office 4 was bought in 1987. Suppose that the computer in office 2 and the computer in office 3 had been bought in the same year as each other. If all of the other conditions remained the same, then which one of the following machines could have been bought in 1989? In what year was each computer and printed bought? What computer or printer can, must, or cannot have been bought earlier or later than what other computer or printer? What computer or printer can, must, or cannot have been bought the same year as what other computer or printer? The Initial Setup: One of the most important choices we have to make with this set is deciding how to organize its information. As with most matching sets, you can either use a grid or lists to keep track of the info. Looking at this set, a grid might be slightly more useful than the lists. Why? Well, look at the information. When deciding how to organize a set, look for what is variable and what is definitely set. Here, the four offices are definitely set, and one computer and one printer in each are definitely set. Note that we shortened the dates from 1987, 1988, 1989 to just 7, 8, 9. This is a good timesaving trick. The dates are all identical except for the last digit, so we’ll only concern ourselves with that digit. 2) Here’s information that connects the machines in two different offices. The computer in office 2 and the printer in office 1 were bought the same year. Build this directly into the sketch by drawing arrows between the boxes representing these two machines. 3) More inter-office information—the computer in office 3 and the printer in office 4 were bought in the same year. Again, build this directly into your sketch by drawing arrows connecting these two squares of the grid. 4) This time we’re given two machines bought in different years: the computer in office 2 and the computer in office 3. 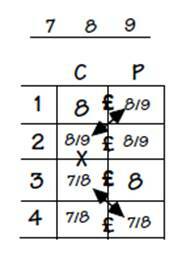 Build this information directly into the sketch by placing a “X” on the line between the corresponding squares in the grid. 5) gives the only concrete information of the bunch. The computer in office 1 and the printer in office 3 were both bought in 88. Build this right into the sketch. This set has a ton of entities and a ton of rules. Both of these facts are hints that there’s some major deducing to be done here. So let’s get started. Begin with the concrete info in Rule 5. The computer in office 1 was bought in 88. Rule 1 says that each office’s computer was bought earlier than or the same year as that office’s printer. So the printer in office 1 must have been bought in 88 or 89. Add this to the sketch. Rule 2 says that the printer in office 1 was bought the same year as the computer in office 2. Since we just saw that the printer in office 1 was bought in 88 or 89, so was the computer in office 2. Add this to the sketch. From there Rule 1 comes back into play. Since the computer in office 2 was bought in 88 or 89, the printer in office 2 must also have been bought in 88 or 89. Add this to the sketch. Back to Rule 5. Since the printer in office 3 was bought in 88, the computer in office 3 (bought earlier than or the same year as the printer—Rule 1) must have been bought in 87 or 88. Add this to the sketch. Since the computer in office 3 was bought in 87 or 88, we can combine this with Rule 3 to deduce that the printer in office 4 must also have been bought in 87 or 88. Add this as well. Finally, since the printer in office 4 was bought in 87 or 88, Rule 1 means that the computer in office 4 must also have been bought in 87 or 88. Add this to the sketch. The printer in office 3 was bought in 88 (Rule 5). The only way for the computer in 3 to be bought earlier is if it was bought in 87. Rule 3 says that the computer in 3 and the printer in 4 were bought the same year, so the printer in office 4 must have also been bought in 87. Eliminate (D) and (E). Each office’s computer was bought in the same year as or earlier than the printer in that office (Rule 1), so since the printer in 4 was bought in 87, the only year that the computer in 4 could have been bought is also 87. Eliminate (C). (A) and (B) are all that’s left. We deduced in the setup that the computer in office 2 must have been bought in 88 or 89. Cross off (A), which leaves (B), the answer. Here’s a could be true question with no new information. Normally this type of question might take a lot of time to answer. Here, however, with all the good work we did up front, we should be able to eliminate the wrong answer choices quickly. Just compare each choice against our master sketch. (A) No, the printer in 1 must have been bought in 88 or 89. (B) No, the computer in 2 must have been bought in 88 or 89. (C) No, the computer in 3 must have been bought in 87 or 88. (D) Yes, the printer in 4 could have been bought in 88 (or 87). (D) could be true and is the answer. (E) No, the printer in 4 must have been bought in 87 or 88. We want as few machines bought in 87 as possible. Check our master sketch. There are only three machines that could have been bought in 87. The computer in 3, the computer in 4, and the printer in 4 all were bought in 87 or 88. The stem asks for the fewest number of machines bought in 87, so could all three of these have been bought in 88? Sure. Rule 3 says that the computer in 3 was bought the same year as the printer in 4, so both of these could have been bought in 88. Rule 1 says that the computer in each office must have been bought the same year as or before the printer in that office, so the computer in 4 could have been bought in 88 as well. All of the other machines couldn’t have been purchased in 87 (see Key Deductions), so it turns out that we need not have any 87 machines. In other words, the fewest possible number of machines that were bought in 87 is 0, choice (A). Remember that the printer in each office was bought either the same year as or later than the computer in that office (Rule 1). If the computer in 4 was bought in 88, the printer in 4 must also have been bought in 88 (we ruled out 89 as a possibility for the printer in 4 under Key Deductions). We’ve just made a new deduction, so stop and see if that is an answer choice. It’s not (although we can eliminate (E) which has the printer in 4 bought in 89), so keep looking. Rule 3 says that the printer in 4 and the computer in 3 were bought the same year, so the computer in 3 must have been bought in 88. Is that a choice? No, but we can cross off (D) which has it bought in 87. Rule 4 says that the computer in 2 can’t have been purchased the same year as the computer in 3, so here the computer in 2 must have been bought in 89 (again check Key Deductions to see how 87 was eliminated for the computer in 2). Is “computer in 2 bought in 89” an answer choice? No, but we now know that (C) must be false, so cross it off. Moving along, Rule 2 says that the computer in 2 and the printer in 1 were bought the same year, so the printer in 1 was bought in 89, and finally that’s the answer, choice (B). If the computer in 3 was bought in 88, Rule 3 dictates that the printer in 4 was bought in 88 as well. Rule 4 (computer in 3 and computer in 2 bought in different years) means that the computer in 2 was bought in 89. From there, Rule 2 (computer in 2 and printer in 1 bought in the same year) insists that the printer in 1 was bought in 89. Also, since the computer in 2 was bought in 89, Rule 1 means that the printer in 2 was also bought in 89. The stem asks for what could be true. The only machine that still has more than one option is the computer in 4 which could have been bought in 87 or 88. Look first at any choice that includes the computer in 4. Sure enough, choice (D), the computer in 4 being bought in 87, is the only possible choice. And here’s the one question that absolutely must have a new sketch. Now we’re to consider what happens when the opposite of Rule 4 is true. The computer in 2 and the computer in 3 now are bought in the same year. Take a moment and create a new master sketch including this new information. Look at the original sketch and note what information still holds. The deduction that the printer in 1 was bought in 88 or 89 still holds, as does Rule 2 which means that the computer in 2 was also bought in 88 or 89. The stem says that the computers in 2 and 3 were bought in the same year, so the computer in 3 must also have been bought in 88 or 89. But wait. The printer in 3 was bought in 88, so Rule 1 means that the computer in 3 can only have been bought in 88. This also means that the computer in 2 was also bought in 88 (thanks to the new information in the stem). From there, Rule 2 means that the printer in 1 was bought in 88 as well. Since the computer in 3 was bought in 88, Rule 3 forces the printer in 4 to have been bought in 88. The only machines that possibly weren’t bought in 88 are the printer in 2 (88 or 89) and the computer in 4 (87 or 88). The printer in 2 is the only machine that could have been bought in 89, choice (C).